The concluding issue of the No End in Sight arc for Uncanny X-Men, Iron Man, and Nova is upon us. Sean Ryan has pulled together three big titles for Marvel to deliver this story. It is great to finally see the threads of this little jaunt come together. My last review of Iron Man Special 1 was a little mixed. While the story was developing fine, the art was pulling back the narrative a little. Can this be redeemed, as hoped for? 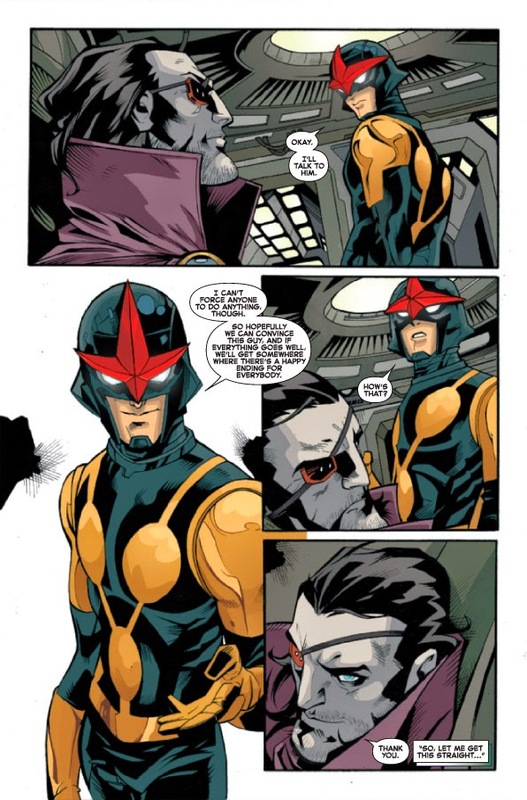 The crossover with Nova seems to make more sense than the Iron Man issue. The linking of teen characters, who face similar challenges such as superpowers at a young age, makes this more homogenous. But also, the story just flows better here. However, as far as the story goes, what does it achieve? Well not to be outdone by his younger self, the current version of Cyclops has also ended up in space, albeit not by choice. As his students and Nova now connect to save the day, it is great to see the next generation of characters take a driving seat in the story. This seems to match the faith Marvel has in expanding the exposure of writer Ryan for this crossover arc. Ryan has done well to craft a believable story spanning different titles. 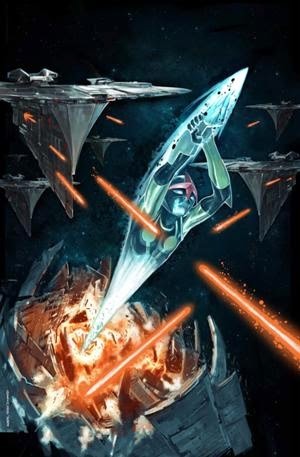 The pitch and volume are unique to this writer and so we shouldn't expect that same outcome as the regular series writers. As far as concluding the story, everything is tidied up nicely. In fact it is great to see some experimentation with the writer and artist, John Timms, when they approach the paneling in a different manner in Nova Special 1. The pace is quickened by their multiple use of close up, small square panels to get the view of the various characters during this issue. This is balanced by some wide angle, full page layouts on other pages. The visual style utilised in Nova lends well to supporting the story and is an improvement. It is also nice to see some further character development. In Nova, we see the title character continue his journey of discovery which is a hallmark of the regular series. The final few pages show this particularly well with the use of silent observation for Nova. We are also treated to see Triage from the Uncanny X-Men questions his place (and the new wave of mutants in general) amongst the previous generation. There is a tender moment of response from Magic to Triage which adds depth to the story. 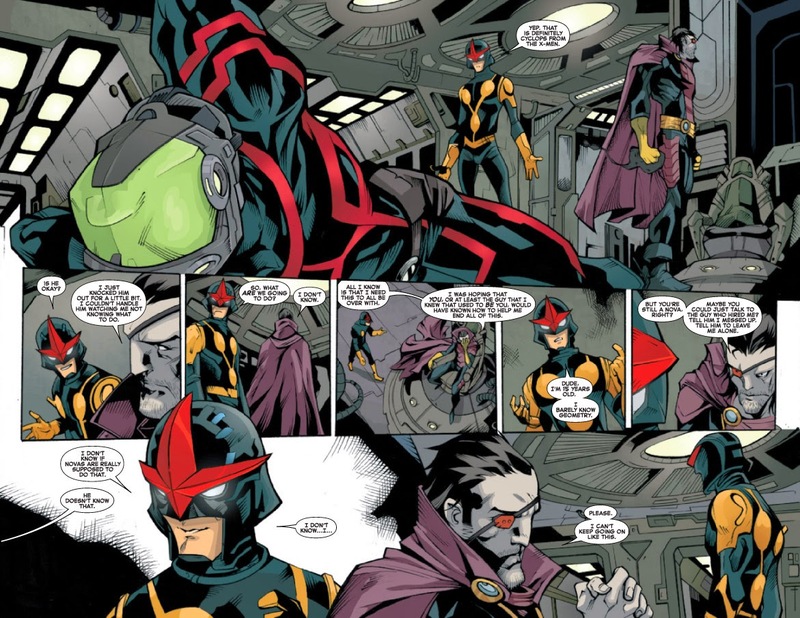 There is one moment that is questionable however in Nova Special 1. A panel of the Uncanny X-Men teens, just after they have show up to save Cyclops, shows Tempus exclaiming she has 'read her mind', when speaking of another opposing character. However, as far as I am aware (correct me in the comments if need be) I didn't think telepathy was part of her power set. It would seem either this is something new of the comment and speech bubble should have been coming from Mindee, the Stepford Cuckoo, on the other end of the same panel. Is this an oversight on the artists part or the building of the story for Tempus in the upcoming Uncanny X-Men Annual later this year. As far as the art on show in Nova Special 1, John Timms (pencils), Roberto Poggi (inks), and Ruth Redmond (colors) combine in a most adequate way. Of all three issues in the No End in Sight arc this has to be the most pleasing visually. There is a gelling of artists here which caps of the story in a fine fashion. The art and colors seem to do here what was needed from the outset, so it is great to see this achieved. Overall, I would say the No End in Sight story is a worthwhile read. It is nice to see the variety of talent Marvel has to produce comics. It is a journey to see them develop over time, as much as it is to enjoy these regular characters. Let me know, did you enjoy these special issues? What was your favourite part of No End in Sight? As always leave your comments below.